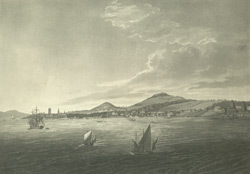 View of the city of Dundee on the eastern coast of Scotland, drawn from the Firth of Tay. Records show that a settlement has existed at Dundee since the year 83AD when the Romans used it as a supply port. The most prominent natural feature of the landscape of Dundee is a large basalt which rises to a height of 174 meters or 571 feet. This rock is called Dundee Law or Law Hill and is the highest point of the city; it can be seen here to the right of the print. An Iron Age fort once stood on the peak of the rock but now a 20th century War Memorial stands here.